Printed books are wonderful, but let’s face it: They are heavy, they can be a challenge to organize, and they sometimes wear out. Wouldn’t it be great if you could store hundreds of books in a small package, adjust the print size to suit your eyesight and preference, and save time and money building your library? Yes, it would! 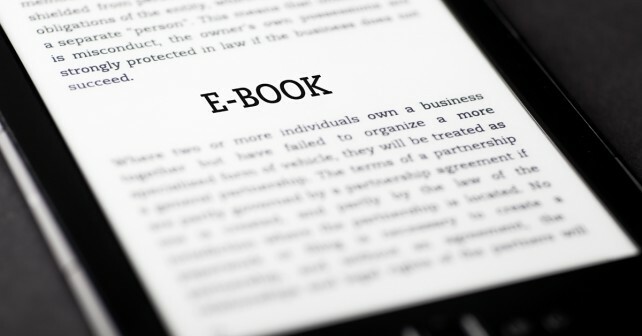 A recent book-industry study found that electronic books account for slightly more than one in every ten books sold. But the rise of electronic publishing seems to be speeding up, with the number of people who have bought or borrowed an e-book nearly tripling during the past two years. So although your favorite bookstore, newsstand, and library should be around for many years to come, you owe it to yourself to see what all the digital fuss is about. The American Library Associationsays that more than two-thirds of public libraries in the United States offer online lending ofelectronic books. There are others, too, and the competition is driving prices ever lower. Electronic Ink or Lighted Display? When choosing an electronic reader, you must consider display type and quality, which are essential to a pleasant on-screen reading experience that’s free from eyestrain. You’ll quickly discover that there are two broad types of electronic reading displays: unlighted “e-ink” screens that come standard on the lowest-priced e-readers and brighter, illuminated display screens that are found on the more feature-laden hybrid reader-tablets—not to mention the backlit display screens on computers, tablets, netbooks, and smartphones, which also allow you to read all manner of electronically published material. Will E-reading Save the Book? Just as some people worried that the distribution of films on videotape might hurt Hollywood—it had apositive effect, as it turned out—some have wondered if people will keep reading in the computer age. Good news! A recent study found that half of Americans who own e-readers read even more now than they did before they bought an e-reader. Buying an e-book is easy. You can either browse the listings of an online store or visit the website of any of the major booksellers and then purchase the books you want. E-readers, such as the Kindle and Nook, can store a large number of titles—more than you probably need to bother worrying about having. Depending on the model, an e-reader will hold a few hundred to more than a thousand books! And the prices for most electronic books—even best sellers and other new titles—are less than the prices for physical versions the same books. You don’t have to stick to books, either. Faced with steep declines in the circulation of printed periodicals, many savvy newspapers and magazines make it easy for you to sub-scribe to their publications over the Internet. Amazon and Barnes & Noble both offer periodical purchasing options at their online bookstores. recharge one of these hardy gadgets for weeks! Even though Amazon, Barnes & Noble, Kobo, and other e-reader makers have branched out into colorful, lighted-display reader-tablets, they still sell simple, elegant e-ink readers, which can sometimes be purchased for less than $100. Screen quality and size may be paramount to you, but other e-reader factors matter too. Like their more full-featured tablet relatives, many e-readers have versions that let you shop for and download books via a cell-phone carrier’s network, and lower-priced versions that use wi-fi or wired Internet connections in homes, coffee shops, or airports. If you travel extensively, the networked version may be worth the extra money. Storage space is usually not a big consideration with e-readers, since most can hold lots of books and periodicals at once. Even the most basic e-readers include headphone jacks and often external speakers, so your reader can double as a music or audiobook player. Some even include built-in text-to-speech features that will read written material aloud, although the digitized voices aren’t exactly high quality. You don’t have to buy a dedicated e-reader or stick to using it if you do own one. Most electronic books used by e-readers can also be opened and read on your computer, your tablet, and even your smartphone! The iBooks fi le format can only be opened on Apple devices, but nearly all of the other available formats have the amazing feature of remembering your place in the book regardless of the device on which you open it.